Boot Scrapers for years of heavy duty use. Pick out your Boot Scrapers here now. This wrought iron boot scraper from Renovator’s Supply is a charming and practical addition to any home. 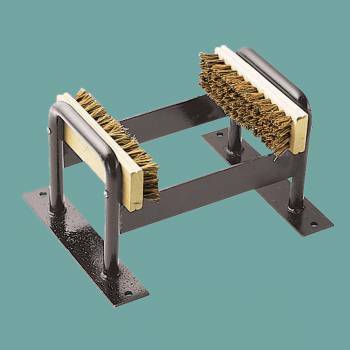 This scraper comes with two replaceable brushes and may be mounted to the floor or left freestanding. If you're thinking, who uses boot scrapers in this 21st century then probably you are not aware of the fact that such items are now back in the market with a boom.Cast iron boot scraper is usually found in courtyard of homes. These are basically used to remove mud from the those dirty mud-dipped boots. At Renovator's Supply, we offer items made up of cast iron, so as to make them strong enough to remain firm in one position while being in use.Although these were favored outdoor home accessories in Victorian Era, they are now back in market because of their antiquated nature and usefulness. 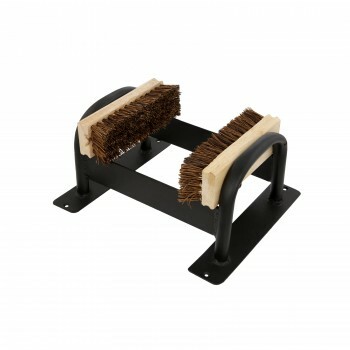 These days, home renovators are looking for such pieces to keep away those muddy boots approaching their cars or finely raised pathways through their beautiful gardens.In order to facilitate more, our products such as Item# 21135 is equipped with two brushes on either side to ensure complete cleaning of the boots.